I’d like to present my final entry for the Eurobricks Architecture Contest. My entry is a micro scale model of the University of Waterloo Mathematics and Computer Science building. The base is 57x 34 studs. 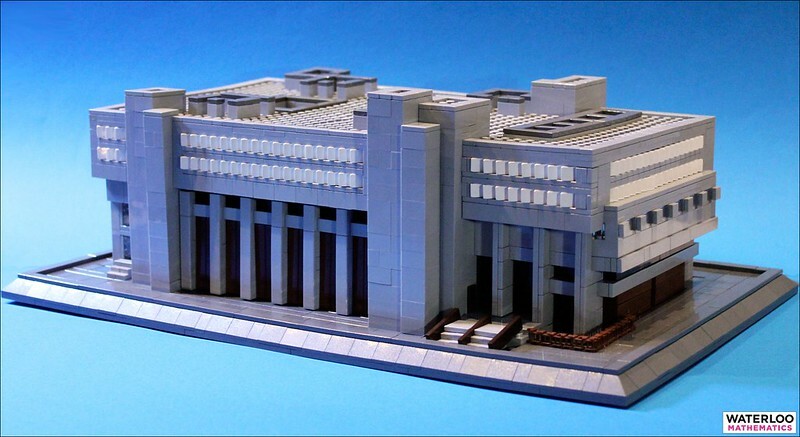 The building consists of 1600 bricks. 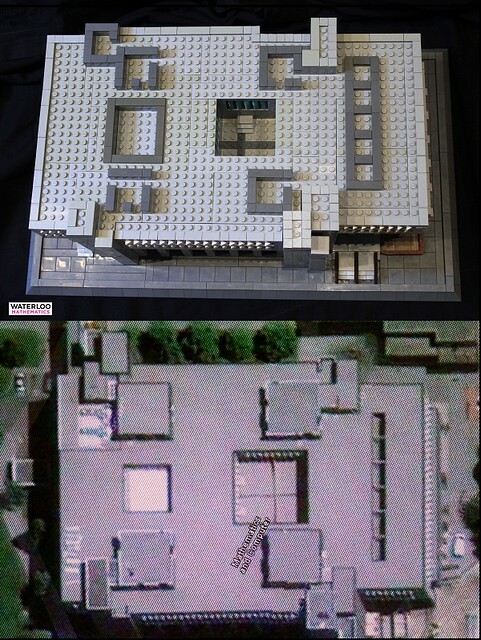 The MOC is the same size as the TLG set- Robie House. Why I chose this building? I was browsing the Internet for an idea but couldn’t decide on anything. It was my elder brother who gave me a tip. He suggested that I should make one of the campus buildings of UW, where he’d got his diploma. I liked Maths and Computer Science building, which is a typical example of brutalism, most of all and immediately got to work. Few days ago I found True Dimensions's creation. This was gorgeous! And I solved, that I must finish entrу. I ordered necessary bricks from Bricklink and continued work. Hope you like it! Most people strongly criticize Brutalism, calling it ugly piles of steel and concrete. But I don’t think it is so harsh and hostile after all. Aesthetics of Brutalism appeals to me. I am fond of clean lines and simple geometric forms. Of course I wouldn’t call Brutalist buildings beautiful. What I like them for is the fact they reflect our life style. We tend to choose functional things at reasonable prices nowаdays, don’t we? I agree with a French architect Charles Edouard Jeanneret, better known as Le Corbusier, who considered all buildings to be tools and said: “A house is a machine for living in." And brutalist buildings are cheap and functional. Yay! Love a bit of Brutalism :o) Great job, very nice forms. I like the sloped edges on the base too. Very nice! The large scale allows many details. Although I can't accept the windows shape. Anyway it is a good entry! Very nice! It was a bit surreal seeing your post, having just posted my own a few days ago. I like your solution for the main windows. At this scale there aren't a lot of options, but the cheese bricks definitely evoke the feel of the original for me. Well done and good luck in the contest! Very nice! 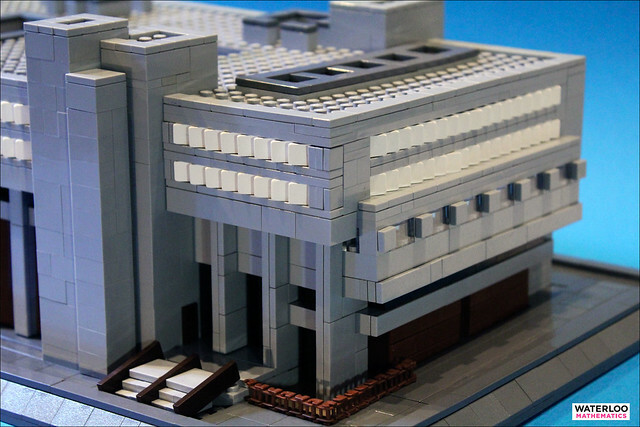 While it isn't a famous building per se, you've captured it in Lego very nicely. UW is one of my prospective schools, so when I visit, I'll be sure to keep an eye out for this! Ha! Thanks! I think about it, but this building seems to me much more available. Was you a student of Mathematics and Computer building faculty too? At this scale, I think it is the best solution for the windows. I thought about it a lot) can you say another way? WAH! This is really gorgeous! I LOVE IT! The main entrance has been perfectly done) Why you didn't add some minifigures? I think- it will be very pretty! No, I took engineering at Waterloo. I only had one computer science class in that building, but I did walk past it every day! 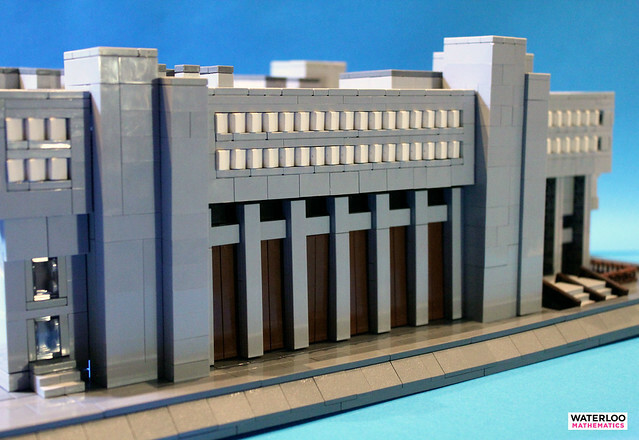 Personally I quite like brutalism. You've chosen an interesting building and rendered it really well in the Architecture style. Hm... this is really interesting. Nice tumblr of Brutalist buildings here - contains swearing! Nice to see Brutalism get some love again - there are a lot of bad buildings done in the style, but the great examples of it really stand up against any other style in my opinion. This is a great rendition of the building and it is really interesting to seeing two renditions of this by two different people in such a short time. Definitely one of my favorites. It is very important to me to hear this words) Thanks. I've been on campus before and recognized it- as mentioned the cheese wedge windows are really nice, as is how you did the railings on the stairs. About tie: I thought about it, but I wasn't sure that stickers are allowed. Good luck to others contestants! Other entries are so great! Good luck to others in the contest! I voted 1 point for you! I am glad to see you here, on Eurobricks! I hope to see some of you new works soon!